"reliable friendly staff and good professional service"
"In the year that we've been using American Legal Investigations & Support Services' , they have provided us with great services. The whole staff is always courteous and professional. We plan to continue doing business with them." "As a commercial litigator with a busy caseload, the last thing I want (or have time) to worry about is whether service has been completed timely and properly. 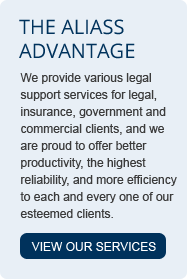 I have been using American Legal Investigations & Support Services, LLC for approximately five years. 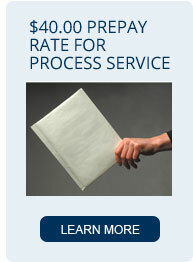 They offer fast and reliable service, but are set apart by the personal attention that is given to each job. Steve and Laura are always available to discuss your service preferences (or requirements) and will go that extra mile to make sure that your papers get in the right hands." "We have been doing business with ALIASS for at least 5 years. We particularly use ALIASS for Private Process and we have found their service to be reliable, dependable and professional. It has been a pleasure working with ALIASS and we look forward to a continuing relationship with them. We highly recommend ALIASS." 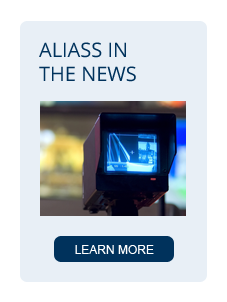 "I have been using ALIASS for many years now for a variety of services for which they offer. I am always confident that my documents will be served properly and that any request or concerns that I may have are addressed in a timely fashion. Their staff is courteous and knowledgeable. ALIASS has never ceased to amaze me by going the extra mile to ensure the best possible results."